As there is no Kuwait section here, yet, this will adress that. 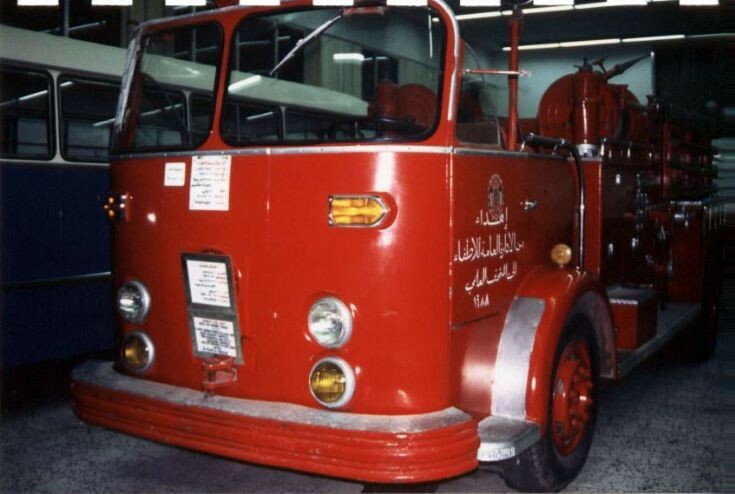 There were still two Crown pumpers in Kuwait in 1997, this one at the Kuwait City Science Museum and another at the Fire Department workshops being refurbished for despatch overseas to some third world country. I know they had 2 only, and I always thought they got ride of them already or got damaged by the Iraq troops before the 1st Golf war. Added by Frank van der Weerden on 02 January 2010. A Crown Firecoach pumper; so familiar to many, many of us in North America; even though we were not necessarily fire-fighters, or even laid eyes on an Firecoach. How ? Television series "Emergency! ", 1972 - first 2 seasons had a 1965 open cab Crown Firecoach pumper as 'Engine 51', its crew led by Captain "Hank" Stanley, that supported the lead characters, Paramedics Johnny Gage & Roy DeSoto in their Paramedic truck. 'Engine 51' was played by a real-life working fire-engine - namely Engine 60 of Los Angeles County Fire Department, California, USofA; that was stationed at Universal Studios, where the TV series was filmed. The TV series lasted 6 seasons - not quite as long as the British TV "London's Burning" ! - the show bought their own fire-engine, which replaced the Crown Firecoach, for subsequent episodes. Added by Pat Rivers-Bowerman on 03 January 2010. I lived in Kuwait until last year. Most of the fleet is MAN, with some MBs and a few Ivecos. The only US sourced trucks now are Dodge light rescue trucks and Chevy/GMC SUVs used as minor alarm and special service units with 2 man crews. The Dodges get a workout, because a lot of calls are to traffic accidents, which are often horrific. Surprisingly, most of the otherwise very modern and affluent city has no water mains, so there is a heavy reliance on water tankers. The central Civil Defense station on the fifth ring road has more than 40 bays (yes, 40!) and most of these are occupied by tankers, including a large fleet of 42 tonne semi trailers. Added by Rob Johnson on 11 June 2010. Kuwait received four Crown pumpers in 1957, Makers serial F1970-73. Added by Ronald Henderson on 21 June 2010. Added by Alan Ramsay on 21 June 2010. Hi Alan; you can see the bus (motor coach) origins of this Crown Firecoach (like the British Regent) as the California company first started out making buses and school-buses. Their fire-engines were big in the USofA West Coast and Western States, Los Angeles FD, etc. As a TV fan; I had thought the 'flat' front a bit ugly, say, compared to the American LaFrance Series 700 to Series 1000 trucks: but, it is immensely practical and, good design...according to FD Web-Sites; many Crowns are still in service. Added by Pat Rivers-Bowerman on 24 June 2010. Thankyou Pat.Yes,while on holiday back in 1989/90 and staying just outside San Diego in a place called Chula Vista,I visited the lovely City of Coranado just across the bay from San Diego and this department still had Crown's still in use.I did take some pictures and will endeavour to send in to site.Pete. Added by Pete Matten on 24 June 2010. Am past president of Crown Firecoach Enthusiasts. Kuwait received 4 Crown engines in 1957 all with 1500 Gal Per Min pumps, 600 gal water tanks and 1091 Hall Scott engines. Did anyone get the F# from plate under the dash on rig in photo. Would be nice to know which one survived. If Ronald has any other info could he email me with info (click my name in blue). We (CFE) like to know where the old rigs are now. Thanks. Added by Don Beckwith on 08 July 2010. Hi there all of you!On the westcoast of USA, there was a big consumer of Crown Firecoach! The Los Angeles City Fire Department, had a lot of them, even the Los Angeles County Fire Department was using them.AND, they are Classic vehicles!!! I have contacted you with regards to a different engine than this 1, the problem being I am trying to track it down in secret so therefore didn't want my comment posting on the page relating to that 1 in case I am sussed! It belonged to my grandfather & 50 years ago in Dec my parents had it as the transport to their wedding. It is their 50th wedding anniversary this year & myself & my brother are trying to track it down to see if we can have a photo taken of them standing with it 50 years on! If you have any details as to who I can contact with regards to its whereabouts I would very much appreciate any help that I can get! Added by Jo Taylor on 29 September 2015. OK Jo, the photo was taken at the Fire Services Museum Trusts site at Weedon, Northamptonshire about three years ago. I spoke to the owner, an elderley gentleman who said the machine was on loan or had been given to the trust, I cannot remember which now. However the Trust has had big problems since then regarding accomodation and has sold off many of its artefacts and some of those on loan have been returned to their owners. Best thing is to try and make contact with some one from the museum but that is easier said than done. Added by Ronald Henderson on 30 September 2015. Thanks very much for that information it is a big help * we will carry on tracking her down! Added by Jo Taylor on 06 October 2015.